Hybrid option | What Car? The CO2 champion of the range, however, will be the hybrid due in 2011. This pairs a 305bhp 3.5-litre V6 petrol engine with a 67bhp electric motor thats powered by a lithium-ion battery pack, and includes a number of technologies to increase the amount of time it can run on electric power alone and to cut energy losses. The engine is decoupled when running in electric mode to reduce mechanical drag, while the modified seven-speed automatic transmission has no loss-inducing torque-converter. Gearshifts are motor-assisted and said to be super-quick, and throttle response is also supposedly sharper. The M is a bit of tech-fest in the areas of comfort and safety, too. It includes ways to cut down noise in the cabin and keep the air pollution-free and fragrant, and a world-first blind-spot warning system that actively tries to prevent you from steering into the path of another car when lane-changing. 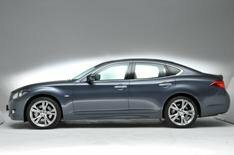 > Infiniti M 5: click to enlargeThere are four selectable driving modes, including an eco feature to help you get the best fuel consumption. When running in eco, the accelerator exerts a gentle resistance to deter you from pressing it unnecessarily hard. Infinitis new multimedia system and self-repairing paint will be standard equipment, and S versions will have four-wheel steering.